Have questions on what needs servicing or what needs replacement? Door Controls is here to help you. Below are some commonly asked questions. If you can’t find your answer below, or require more information, please do not hesitate to contact us. Can you service a competitors product? Door Controls services and repairs ALL makes and models of automatics entrances. What is the lead time for servicing my door? Door Controls provides rapid service with our goal being 24 hour response time. Emergency Service call can be defined as one of the following categories. How often should I get my door serviced? Door Controls recommends a biannual inspection. Do you have certified inspectors? Door Controls are AAADM certified, all technicians carry their AAADM cards with them. What can I do to prevent problems with my automatic door? Once installed, your automatic door should be in good operating condition. You should have received an owner’s manual and this describes routine maintenance, cleaning and safety checks that you can and should perform. In addition to this you should consider a preventative maintenance program offered by Door Controls. This can take on a variety of forms from basic inspections for safety and operating effectiveness to full turn-key plans that include all labour and parts for a fixed fee. My automatic door is not working. What should I do? Call us at (800) 838-8062. Our Service Advisors will ask you a few basic questions when you call in to ensure that dispatching a Technician is the correct course of action. Beyond this, we need to have any and all service work performed by a certified Technician on site. How do you charge for a service call? Our charges included our technician's travel time, the time spent on site either assessing a situation and/or performing repairs, as well as any materials required. If the required repairs are anticipated to be a high cost, we will give you a quote, and ample time to make a decision. We understand unexpected costs are never fun. If a formal quotation is not required, we will ask you to approve the work in advance so we can start the work for you immediately! Whether work is quoted or approved, our technician’s time in assessing the necessary repairs as well as the travel to site is something we always charge for. 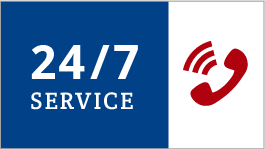 Please note that our services are available 24 hrs/day, however service requirements outside of normal business hours (8:00 am – 4:30 pm Monday to Friday) will be charged at a premium rate. Can I get technical support over the phone? No. Any and all service work needs to be performed by a certified Technician on site. Their physical presence is the only way to ensure that appropriate diagnosis and repair take place. We cover any defects in workmanship or parts for 1 year. We do not cover materials that must be replaced due to excessive wear or abuse. What happens if my door stops working during the warranty period? Call us at (800) 838-8062. Our Service Advisors will ask you a few basic questions when you call in to ensure that dispatching a Technician is the correct course of action. Once our Technician is on site he will perform any necessary repairs. Based on the nature of the repairs, we will determine if this is a warranty issue or not. If there is deemed to be warranty coverage for the repair you will receive a $0.00 warranty invoice showing that work took place and what parts, if any, were used. If the repair is not covered under warranty you will be charge for relevant Labour and Materials. The Labour component will include both travel time and time on site. Can I extend the warranty period on my automatic door? Yes. In addition to Preventative Maintenance Programs we also offer Extended Warranty Programs. If you contact our Service Department prior to the expiry of your initial warranty, we can provide a quotation. What can be done to prolong the life of my automatic door? Performing routine maintenance and cleaning are key to a long service life for your automatic door system. What options do I have if my automatic door operator needs to be replaced? Our Technicians do everything they can to repair existing equipment but there are times when it is either technically or financially not feasible to carry out the repairs. In these instances, we can offer factory rebuilt product or brand new equipment at the customer’s request. Do you service only Door Controls equipment? No. Our technicians can work on any brand of equipment. In the event that a required part is not in our inventory we also are supported by vendors that can readily access these parts. Can Door Controls provide a preventative service program? Yes. This can take on a variety of forms from basic inspections for safety and operating effectiveness to full turn-key plans that include all labour and parts for a fixed fee. How can Facility Managers or Owners ensure the safe operation of their automatic door systems? AAADM is the industry association that governs the automatic door industry and they provide guidelines designed to ensure that automatic openings comply with ANSI safety requirements. The daily performance and safety checks described in your owner’s manual are an ideal starting point. In addition, AAADM suggests an annual inspection by an AAADM certified technician. This is a key component to both the continued safe and effective operation of your automatic opening as well as a key piece of evidence in an ongoing safety due diligence program for the facility. Can any technician perform service or maintenance work on my automatic door system? Service work should only be performed by AAADM certified technicians. During the warranty period, the work should only be performed by the vendor’s technicians for your warranty to remain valid. Are all of Door Controls’s Technician’s AAADM certified? Absolutely. All of our technicians all are certified. Unlike some of our competition who outsource their work, all of our Technicians are factory trained and direct employees.